Acemoğlu and Robinson rightly argue in ‘Why Nations Fail’ that chance decisions by leaders play a big part in economic success, but using the Congo Basin’s Lele and Bushong as an example of this may be a mistake. One significant argument in Daron Acemoğlu and James Robinson’s fascinating and highly informative recent book ‘Why Nations Fail’ is that a considerable degree of chance, or ‘contingency’, controls the rise of economically successful states and nations. What they particularly mean by this is that the actions and decisions of individual leaders can have huge effects on outcomes – a sort of economic butterfly effect. Now I guess that this must be true. In a modern world with cheap(ish) oil, and global transport even of the cheapest commodities, the policies of Chinese leaders have made a huge difference to the development of China. But I feel that Acemoğlu and Robinson have thrown the baby out with the bathwater in trying to explain some prehistoric and marginally historic events purely on the basis of this kind of chance. Once upon a time transport and economic success was a matter of making do with the waterways, seaways, passes and ridgeways that geography provided. Because of this, I suspect that some places were naturally better endowed for creating and accumulating wealth than others. This had nothing to do with the choices of leaders. Acemoğlu and Robinson do not take such considerations into account in their book, even arguing against their significance. Instead, in three examples, they make the case that community or leadership decisions alone caused the major outcomes seen in certain prehistoric and marginally historic events. Their first example is the agricultural revolution in the Middle East in the tenth millennium BC. Their explanation for this, against the views of many (including, famously, Jared Diamond), is that it was the decisions taken by local leaders that caused the development of a creative society with an agricultural base just here at the end of the Pleistocene. Acemoğlu and Robinson may or may not be right in this. Either way, the hypothesis is untestable. Their second example is the collapse of the Maya civilisation of the Yucatan Peninsula, Central America in the first millennium AD. This example, which really deserves a blog post of its own, says that Maya collapse was simply due to bad leadership. Others, again including Jared Diamond, view the collapse as a result of climate change or the over-exploitation of the land by the Maya. Other explanations are equally possible. However, it’s Acemoğlu and Robinson’s third example, on the divergent paths the Lele and Bushong peoples in the Congo Basin around the seventeenth century AD, that I want to talk about here. The Lele (aka Leele) and Bushong (aka Bushoong) are two groups of people living on the Kasai River in the Democratic Republic of Congo. Two well known academics, Mary Douglas and Jan Vansina, independently studied these groups in the late 1940s and 1950s, near the end of the Belgian colonial era. Map showing the Congo River Basin between 16th and 17th century, showing the distribution of kindgoms and peoples in and around the basin. The map includes the distribution of dense forest (green) and the more important rivers (wide black lines are navigable rivers). Also shown are the distributions of copper deposits (orange areas marked CC), including the large copper deposits of Katanga in SE Congo. Note the later southern caravan route (dotted) from the coast at the head of the Cuanza River into the interior and the Zambezi. This approximate route used by slave traders from the end of the seventeenth century and by Livingstone in the nineteenth century. Finally, dashed lines mark the approximate outer limits of major kingdoms during this time. The Lele and Bushong live, respectively, on the left and right banks of the Kasai. Both groups inhabit an area at the boundary where classic jungle in the north gives way to more open forest in the south. The Lele live on slightly more sandy, less fertile soil which is more prone to drought, but in other respects the environmental differences are small. Lele and Bushong languages are closely related and mutually intelligible (sharing perhaps 80% of words). What struck Mary Douglas at the time of her fieldwork was the huge differences in habits between the two groups, even taking into account the small differences in their environments. Bushong men and women appeared to be hardworking, working from their late teens to their mid sixties (like most of us). They were technologically relatively advanced, had many belongings, were collaborative, generally monogamous, married young and sought to become financially well off. The population density was estimated (once other factors had been taken out) at around 3.4 per square kilometre. On the other hand the Lele, and men in particular, were portrayed as lazy, working only from their thirties to their late fifties (oh bliss). They were technologically backward, selfish, had many wives (limited to preparing food and keeping house) but only married when old. Indeed, in later life men jealously guarded their rights to the village women and to easy living. The young men, presumably due to sexual frustration, were warlike and frequently raided other villages to get their kicks. Even the things that the Lele prided themselves on, such as hunting and fishing, they were worse at than the Bushong. Population density estimates here were around 1.7 per square kilometre. In terms of trade, the Bushong produced a number of goods for exchange, including crafted items and a surplus of food. Before colonialism they had used shells, copper and beads for currency in this exchange. Conversely, Lele men produced only a smallish quantity of fine raffia cloth, their one item of exchange and currency (but, interestingly, something that they made better than the Bushong). From Acemoğlu and Robinson’s point of view, the important difference between these societies is the degree of organisation and centralisation. The Bushong represented the wealthier citizens of the Kuba Kingdom. According to Vansina’s reading of oral history, the Kuba Kingdom had been established by the unification of Bushong and other groups around their first king, Shyaam a-Mbul a Ngoong-Shyaam, possibly an immigrant, in the seventeenth century. Acemoğlu and Robinson argue that it was the decisions of Shyaam that caused the differences between the Lele and Bushong. They argue that he gave the kingdom a well established bureaucracy and laws that gave the Bushong people some rights within this system. These rights caused the economic success of the Bushong. The Lele, outside the kingdom and never subject to such wise rule, were left relativedly poor and socially fragmented to the level of villages. Thus, according to this reading, the Lele and Bushong had equal chances in the lottery of life, yet only one made good on those chances. Personally, I suspect that some more mechanistic reasons for these differences should be taken into account in weighing up the development of Lele and Bushong. When Portuguese explorer-merchants first managed to sail to the mouth of the Congo at the end of the fifteenth century they found an existing African trade network which they, at first, simply joined in with. This network was controlled by the Kongo Kingdom and its satellite dynasties. At this time, river transport was about the most effective method of moving goods from the interior of Africa to the coast. Much, but not all of the Congo River system was navigable and provided the major highway between coast and interior in this part of Africa. However, the section of the Congo River between the coast and Malebo Pool was not navigable. This was the part controlled by the Kingdom of Kongo, centred on Mbanza Kongo (later renamed San Salvador). By dominating this area, Kongo regulated the flow of prestige goods such as ivory, copper, gold and slaves coming from the interior, and of nzimbu shells and raffia cloth travelling from the coast (to south and north) back into the interior. It was not a huge trade system was it made a comfortable living for the leaders of Kongo. The Portuguese merchant seamen were initially able to extend the coastal trade networks to other coastal African kingdoms further north, acting as middlemen and profiting in the process. Presumably, this also profited Kongo. However, slaves soon turned out to much more valuable to them. At first, this was because the shortage of labour in Europe after the depradations of the plague meant that manpower had a high price. But soon the establishment of sugar plantations in Cape Verde, Sao Tome and Principe (and subsequently the Caribbean) required a larger input of slaves to work on theses plantations instead. The Portuguese paid for these goods with manufactured European ‘luxuries’ such as coloured glass beads, brass and fabric, as well as alcohol, guns and the new crops of the New World. Initially Kongo started to export slaves in small numbers to the Portuguese to satisfy this demand, both doing well due to their monopoly in the early sixteenth century. 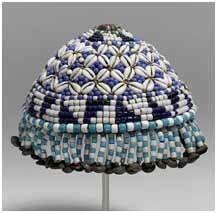 But this brought competition both from African neighbours to north and south and from other European sailors. The Loango, further north, bypassed the Kongo kingdom to get direct access to the Congo Basin and supplied slaves to British and Dutch sailors. Groups to the south, in alliance with Portuguese settlers, found other sources of slaves by raiding their Angolan hinterland. These suppliers of course had lower overheads. The kingdom of Kongo, unable to compete, and itself increasingly a target of slave raids by the new traders, collapsed in the late seventeenth century. But besides causing the collapse of the Kongo state, the Portuguese had another effect in the Congo Basin. By introducing maize, (and possibly cassava and tobacco) from the New World to the African coast it also resulted in improved farming yields for local farmers, promoting the growth of African populations (thus guaranteeing the supply of slaves). This didn’t just affect the Portuguese controlled coast, though. Maize rapidly resulted in the rise of populations inland, beyond the area of Portuguese ‘influence’. The new slaving ‘kingdoms’ and the rise of population bizzarely had the effect of increasing Africa’s internal east-west trade in prestige goods which had existed before the arrival of the Portuguese. Reorganised or new kingdoms inland, such as the Lunda and Luba, appeared in order to control these expanded trade opportunities. By the end of the seventeenth century new overland trade routes were even appearing between the Angolan coast and the Lunda kingdom, avoiding the Congo Basin altogether. It was during this upheaval that the Kuba Kingdom is supposed to have come into existence. And it seems to me that its location, at the confluence of the Kasai and Sankuru Rivers, was not by chance. Lands upriver of the Lele and Bushong, showing the much greater extent of land confined by the Kasai and Sankuru Rivers and how this connects to the Lunda heartland and, in part, to the Luba. 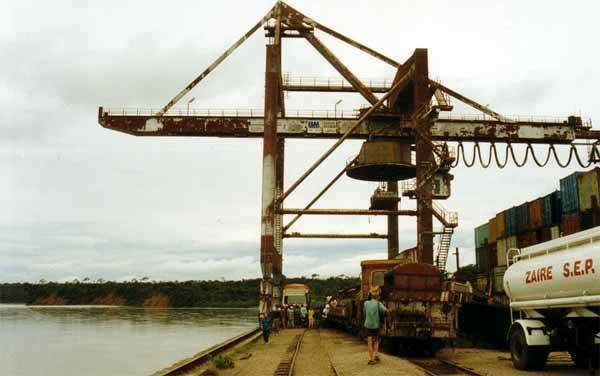 Ilebo has acted as a river port since the seventeenth century AD. This small trading hub was the heart of the Kuba Kingdom. Interestingly, river transport (or what’s left of it) is still central to Congolese transport and Ilebo is still an important lifeline for trade toward the coast. Currently, Ilebo sits at the head of the railway line leading to the Katanga copper mines in southeast DRC (formerly in Luba territory). This railway line is now due to be renovated using Chinese money and expertise. This immediately points up a difference between Lele territory and Bushong territories. For Bushong territory sits at the head of a number of rivers all draining lands of the Luba and Lunda kingdoms, including the Lunda capital of Mussamba. In the case of the Lele, they sit at the head of a very narrow catchment linking only to the margins of Lunda territory. From the seventeenth century onward much trade from the Luba and Lunda kingdoms must have gone direct to the coast over the land route, without going through the Congo Basin at all. However, there must still have been a significant flow of prestige trade items between the coast and the interior (particularly Katanga) through the Congo Basin. It’s therefore useful to look at what trade routes would have been likely. From what I can see, natural routes for transport from the southern kingdoms of Luba and Lunda into the Congo Basin, even if on land, tended to be confined by, and to funnel into the confluence of the Kasai and Sankuru Rivers, somewhere around present day Ilebo, within Bushong territory. This is the natural set of routes for the movement of copper, gold and ivory northward. This is still the case with the present railway. On the other hand, the Lele had no extensive hinterland of commercial interests. The difference in scope for trading upriver was huge and the Bushong clearly had the advantage over the Lele. I suspect that the Kasai-Sankuru confluence has been a good place for trade long before the arrival of the Portuguese, but perhaps on a small scale. I would argue that the rise of the small Kuba Kingdom in the seventeenth century, with the Bushong at its centre, is a story of growing populations and increasing trade, due ultimately to the riches gained from the coastal slave trade. The Bushong, in the right place to pick up that trade, developed systems, specialisation and complex lawcodes as a result. The Lele, who were in the wrong place, did not. Of course chance plays a part in this. The Portuguese may never have turned up, for a start, due to some kingly edict telling them to stop shipbuilding. The Earth could have been hit by an asteroid just as the Portuguese were weighing anchor. I don’t deny any of this. But what I’m saying is that taking the origins of Lele and Bushong as an example of good or bad decision making is a mistake. King Shyaam could help to make this trade more effective by his actions or he could hinder it. However, I don’t believe that he created it. Acemoğlu, D. & Robinson, J. A. 2011 Why Nations Fail: The Origins of Power, Prosperity and Poverty, Profile, pp464. Fage, J.D. 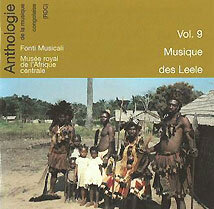 & Tordoff, W. 2001 A History of Africa, Routeledge, pp640. Mitchell, P. J. 2005 African Connections, Alta-Mira, pp328. Oliver, R. & Fage, J.D. 1962 A Short History of Africa, Penguin, pp301. Robinson, J. A. 2011 World Economic History – Lecture 5 (pdf), Harvard – source summarising many points of the book. Sahlins, M. D. 1971 Stone Age Economics, Aldine-Atherton, pp348. Vansina, J. 1990 Paths in the Rainforests: Toward a History of Political Tradition in Equatorial Africa, James Currey, pp448. Wolf, E.R. & Eriksen, T. H. 2010 Europe and the People Without History (2nd ed), Univeristy of California, pp536. Photos of Kuba at Nsheng, 1947. Thomas Tvergaard’s photos from his trip across central Africa, 1997.